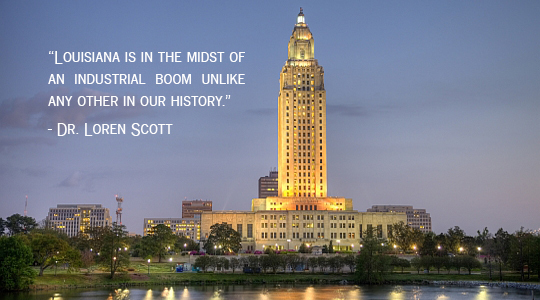 Well respected Louisiana economic experts, Dr. Loren Scott and Dr. James Richardson, released the results of their 2015 Louisiana Economic Outlook. Based on their forecast, Louisiana will set records statewide and in a number of metro areas for the most non-farm jobs in its history, surpassing 2 million across the state. The Super Region – consisting of Baton Rouge, Houma-Thibodaux and New Orleans – is forecast to see incredible growth over the next two years. The area is expected to produce 62 percent of Louisiana’s non-farm job creation – a combined 41,400 of the state’s 66,700 new jobs by the end of 2016. While much of this growth is being fueled by the industrial boom from Lake Charles to Baton Rouge and down river to New Orleans, the encouraging fact is that there are several other sectors, both traditional and emerging, that make Louisiana more diverse. Traditional sectors include international trade, advanced manufacturing and energy. Digital media, information technology, emerging environmental related to water and water management, coastal restoration, and medical are among Louisiana’s emerging sectors. Putting all of these together, the future has never been brighter for our state and our region.